Did LBJ have a double? Do presidents and other world leaders have doubles -- or "political decoys," to use Wikipedia's preferred term? This oft-heard claim inspired Dave, an excellent comedy starring Kevin Kline. Even some people who have an allergic reaction to conspiracy theories will concede that doubles are occasionally employed. Hitler certainly had doubles -- in fact, we even know the name of one of the pseudo-Hitlers: Gustav Weler. During WWII, General Montgomery ("Monty") is said to have used the services of a double named M.E. Clifton James. Not long ago, the Russian government officially acknowledged that a man named Felix Dadaev doubled for Stalin on occasion. The above-mentioned Lobster story -- by one Garrick Alder (a name previously unfamiliar to me) -- draws from a couple of unfortunate sources. One is Nigel Turner's television series The Men Who Killed Kennedy, which I have always considered a very mixed bag. The other "iffy" source is Billy Sol Estes, a Texas con artist with many ties to Lyndon B. Johnson. Late in life, Estes averred that LBJ was the mastermind of the plot against Kennedy. This is a scenario which I do not buy, for reasons outlined here. Obviously, you should tread with care as you explore this territory. Nevertheless, I encourage you to check out Alder's tale. He focuses on a man named Jay Bert Peck, a small-town sheriff who played LBJ in The Wrecking Crew, one of Dean Martin's "Matt Helm" spy movies. Peck -- seen here wearing a hat -- did indeed bear a strong resemblance to Johnson, whom he called his "cousin," even though there was no actual family relationship. One begins to wonder if anyone in Texas is capable of telling an unstretched truth. The rumor is that Peck doubled for Johnson the night before the assassination of JFK. Peck was himself shot to death in June of 1969; his murderer was never identified. Although you may be rolling your eyes at those claims, one aspect of this story is indisputable: In 1974, five years after the unsolved killing of Jay Bert Peck, Liggett was convicted of trying to murder Dorothy Peck, the wife of the man who stood in for LBJ. Liggett hit her in the head repeatedly with a hammer. Believing her to be dead, he then tried to cover his tracks by setting her home on fire. She survived this ordeal long enough to identify Liggett. There's a lot more to this bizarre story -- including the allegation that JFK himself had a double in Dallas on the day of the assassination. That claim comes from Howard Brennan, the only Dealey Plaza witness to place Lee Harvey Oswald in the Texas Schoolbook Depository. As noted above: Read this material with caution. But you gotta admit -- this stuff is fun. If you can suggest a scenario which explains the deaths of both Peck and his wife, I am all attention. Oswald, of course, had his doubles as well. I also have a doppelganger, although not a paid decoy and bullet-catcher, just a lookalike people see around town and then mention to me. That happened to me, Stephen -- way, way back in my college days. Every time I'd buy food at the cafeteria, the cute Asian girl running the cash register would ask about my band. I kept telling her that I didn't have one, and that I played no instruments. Finally, she brought in a local music magazine -- and DAMN! There was a fellow playing drums in an area band who looked exactly, and I mean EXACTLY like me. I should have used this to my advantage, perhaps by asking the cute Asian girl if she wanted to see "me" play. But I think she was more interested in the other me. As for the Oswald thing: It gets very complex and downright maddening, especially if you give a close read to "Harvey and Lee." I'm not sure WHAT to believe! When it comes to Oswald, there seems to be two types of “lookalikes”--the general-description parallels, young white males such as gunrunner John Thomas Masen and Ruby's sidekick Larry Crafard; and dedicated impostors using LHO's name and/or contacts, people such as the the guy who test-drove the Lincoln two weeks before the assassination, the visitor to Silvia Odio's apartment and the impostor at the Dallas gun ranges. I tend to think that someone in the latter category was on the sixth floor of the Depository while Oswald was downstairs eating lunch. That man, in a white shirt, left the TSBD a few minutes after Lee, jumped into the Rambler (as seen by Roger Craig), shot Tippit and was escorted out the back door of the Texas Theater. Then he was spotted in the parking lot of a nearby restaurant, in a car registered to Tippit's best friend. What makes you call the Nigel Turner series a “mixed bag”? I've never looked deeply into the French Connection allegations that are the subject of one segment, and I'm agnostic about whether LBJ had foreknowledge of the shooting: but as a journalist (and JFK researcher) myself, I think that the Turner series is generally well-researched, reported and presented. It certainly was a public service in the years when the History Channel dared to present it. The more I read about spycraft (including in the two books you recently recommended to me, of which the Albarelli is much more fun and readable than the Evica) the more I'm convinced that the over-funded gamesmen had the motive, means and opportunity to use every trick in the book. Drummers are the most important element of a band. For the second time in a day I must mention that Ringo was the best one. "Rush to Judgement" had a good bit about one of the other-Oswalds, I believe. By Joan Mellon. If memory serves. Uh..."Rush to Judgment" was one of the first books on the assassination, by Mark Lane. Joan Mellen wrote a recent work called "Farewell to Justice" and and even more recent work called "Our Man in Haiti." The first book to look into second Oswald theories was Professor Richard Popkin's "The Second Oswald." Although the tale of Thomas Masen is odd and suggestive, ultimately I think that one is best chalked up to coincidence. Nothing ties him to the assassination. He just looked somewhat like Oswald and was arrested by the ATF on a gun charge a week or so before. Farewell to Justice is the one I was thinking of. Read it at the Library a few years ago. Joseph, I agree with you about Masen. Someone with a resemblance is not the same thing as an impostor. Didn't someone argue persuasively that Masen (who was arrested three times in late November '63) was the real guy fingered as LHO in the book "Oswald Talked'? Masen may ave also have been the young white man mistaken for Oswald at the Alpha 66 meetings at the Harlandale safe house. But there's a different class of impostor, people like the man with a car, a pregnant Slavic wife and a baby who called himself "Oswald" when he applied for a radio-station job in faraway Alice, Texas in autumn '63. And then there's the fellow who gave his name as "Harvey Oswald" at the veterans' office in faraway Austin on the same day that LHO was supposed to be in Mexico City. TJoe: I agree, the "radio station" Oswald is really freaky. So many people told stories that are surprisingly congruent. But the "Marina" they met can't have been the real one, because the real one was just a few weeks away from having a baby, a fact which would have been very obvious. The thing is -- I know of NO explanation (conspiratorial or otherwise) for that foray into high weirdness. It's just...weird. Sorry, I must respectfully disagree on both counts. Ringo was without a doubt the most personable of the rock drummers, becoming a celebrity in his own right, but the best in terms of sheer skill would have to be John Densmore of The Doors, who had--IIRC--extensive jazz training and experience. Hello there, glad you liked the piece. I'm looking further into the Peck connection, as I suspect that the FBI chose its words carefully when it reported that Peck "does not appear in the President's genealogy". One wonders how widely the Bureau cast its net. 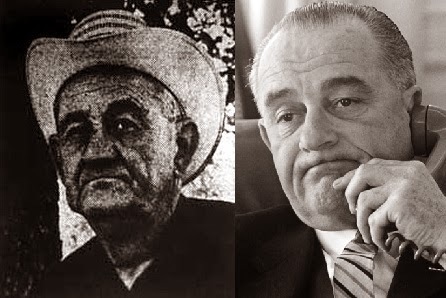 Peck himself wrote to LBJ that the connection was via his maternal grandfather, whose surname does appear to have been Johnson, which obviously wouldn't make him a cousin of LBJ (or at least, not a direct one). I suspect, on that basis and the basis of their facial similarities, that there was indeed a Peck/LBJ connection somewhere in the past. Whether I'll ever get to the bottom of it is another matter. BTW, I was the original author of the Wikipedia 'political decoys' article (long before I got p***ed off with the whole project and its jumped-up "editors") and I note that the Gustav Weler canard is still going strong despite my attempts to strangle it at birth. Weler did indeed resemble Hitler strongly, but was located alive and well at the end of the war in Europe. Quite why he keeps getting named as the unfortunate doppelganger found dead outside the Berlin bunker, I do not pretend to know, but it wouldn't surprise me if the printed sources cited by Wikipedia cite Wikipedia as their source on the matter! Thanks, Garrick. I always thought that was Weler. I mean, that name has been published in a number of places. So...if it wasn't him, who was it? The Peck thing sure intrigues me -- hell, I may even take another look at "The Wrecking Crew"! -- and if you find out anything more about him, I'd be glad to print it.